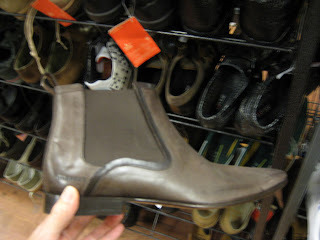 Daffy's Herald Square always has a wild and crazy selection of men's boots & shoes. 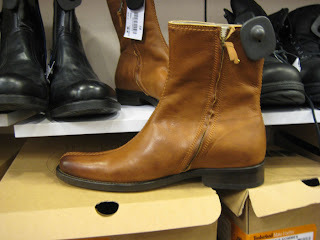 Every time I visit, I browse boy boots and often find some ridiculous deal for my man. 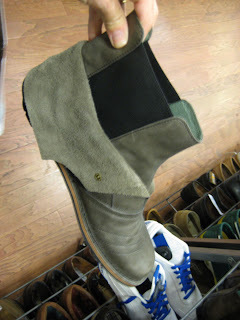 Last week I got him a pair of Ben Sherman slip on leather shoes for $7. They're slightly odd-looking, but you've all seen what my man does to shoes. Looks don't really matter. And he got Ben Sherman for $7. SEVEN DOLLARS. I'd say that's recession-proof. Here's a selection of footwear sitting on the racks. These aren't ridiculous discounted, but there's always a couple racks that are 50% off the lowest marked price. Men, if you're hitting the disco, the metal club, a trashy lounge, or just going to drip oil paint on your shoes all day, drop by Herald Square's Daffy's 7th floor for some new kicks. Studded Robert Wayne shoes, $39.99. I couldn't resist, studs, guys! They're so...Bon Jovi? Trashy? Again, jealous! Prettyprettyprettypretty Ted Baker's, $98.99. I looked for these in something like my size. No go. it's the same people who made these. Which are kind of ugly but hey, it's not studded black suede. 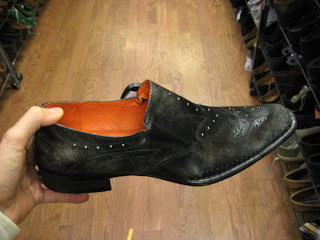 Lastly, these Ted Baker's, $89.99. Digging the mod grey. The colours of the first and third pairs are gorgeous! I also like the design and colour of the last pair. 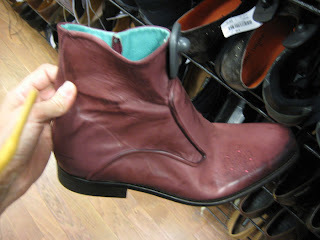 Wow, wow and wow, wish I could find deals like that, these boots look amazing! What finds and what bargains! You have good taste in shoes. And you find ALL the bargains! I love those Ted Baker boots. They totally make me forget that I'm not a man! Aaahh, no way! Take me to this store now! 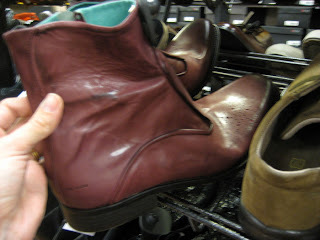 I've been trying to find boots "creatively" like looking at hunter shoes or in the kids section of Lands End. Hasn't been working for me, but maybe I should hit up Sears and look at the little boy's stuff! At those crazy prices I need you go shopping for ME...hmm...which one would you buy me? 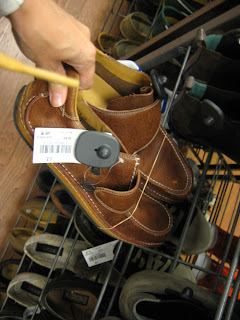 Katlin - great idea, Sears has all those tough guy boots. imelda - the grey Baker's.